After moving into my current home, I discovered that the previous owners had left dozens of light bulbs for the various fixtures in the house. I was happy to know that I wouldn’t have to restock for a while. In the interim, compact fluorescent light bulbs have become inexpensive, and LED bulbs have begun to become economical as well. While I have realized for some time that CFLs are a good investment with a short payback period, I have yet to replace my bulbs. At some level, it feels wrong to throw out all those light bulbs. What is the real return on throwing out a working bulb and replacing it with a CFL? The payback on moving to CFLs is quite fast, a few weeks for high usage bulbs, and several months for bulbs used only one hour per day. The first graph begs the question – how frequently does a light bulb need to be used to justify replacing it with an incandescent? 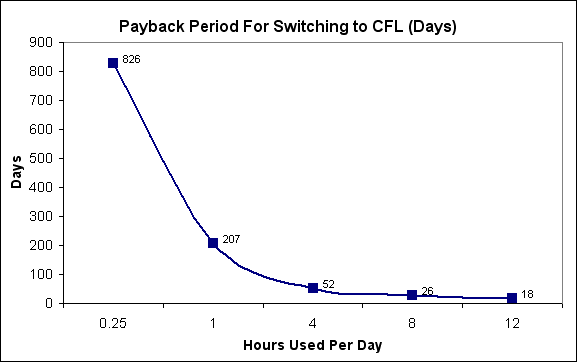 Assuming that a 10% return on investment is desired, that the CFL will last 5 years , and that electricity costs $0.10 per kWh, I calculate that you should replace any bulb used more than 9 minutes per day . That’s a pretty low bar, lower than I expected. As CFL prices have dropped, and light quality has improved , there aren’t many arguments left for sticking with incandescents. And for the lazy, switching to CFLs will decrease the frequency of light bulb changes, resulting in lower effort as well. Conclusion: Throw out your light bulbs and replace them with CFLs today. The quality of CFL light output is now pretty close to incandescent, and you are burning money every day you wait! I replaced roughly 40 light bulbs last weekend, in the middle of writing this post. For the most part it’s worked out – the light quality is decent, but the CFLs still take some time to get to full intensity, and I may have to replace a few that flicker due to dimmers on the switches. Here is my calculations spreadsheet on Google Docs. While this was a sale price, CFL prices have been falling steadily and the standard price at HomeDepot.com is still only $1.25 per bulb (see the 12 pack of 60W-equivalent TCP brand bulbs available at this writing). Many CFLs are warrantied for 7-9 years, and claim 8000-12,000 hours of working life. Five years is thus a conservative estimate, but takes into account the fact that CFL quality control is still an issue, so that some percentage of bulbs will be defective. The calculations in my spreadsheet are linear with respect to purchase price – if you pay $2 for a CFL instead of $1, then you should replace all bulbs used for more than 18 minutes a day, and so on. That CFL light quality has improved is my personal opinion – look around on the web, and you will find hundreds of articles disparaging CFL light quality. I think they’ve come a long way, however, and the soft-white (2700K) bulbs available now do an acceptable job imitating incandescent soft-white bulbs. The data above indicate the huge difference in energy required from one end of the food spectrum to the other. Roughly twenty-five times more energy is required to produce one calorie of beef than to produce one calorie of corn for human consumption. Dairy products are actually fairly energy efficient, as they are very dense in calories. Vegans may indeed be able to boast that their diets use 90% less energy than the average American’s, and even those who eat only eggs and dairy can lay claim to significant energy efficiency. At the same time, food production and consumption amounts to only about 10% of first-world energy consumption, so even the most parsimonious eater can reduce their total energy footprint by around 9% through diet alone. The big culprits remain transportation, heating, and cooling, and while diet modification can help, energy conservation efforts should focus most heavily on these areas. It’s possible to estimate the energy involved in corn production very accurately, since corn energy intensity has been closely scrutinized by both proponents and critics of the corn ethanol industry. This Berkeley study compares energy intensity estimates from two sources, one pro and one anti-ethanol. Using an average of the two studies’ data yields an estimate of 30,000 BTU energy consumed per gallon of ethanol produced. From the same study, about 2.75 gallons of ethanol are produced per bushel of corn, which means that one bushel of corn required 82,500 BTU. One bushel of corn is 56 pounds of corn kernels, so one pound of corn kernels requires 1473 BTU for production. This is equivalent to 0.43 kWh. For milk, the estimates provided in Without The Hot Air Chapter 13 are utilized, with this conversion used for fluid ounces of milk to weight. The estimates for cheese are also taken from the above chapter, with the numbers simply proportionally adjusted from kg to pounds. From Table 3 in this study in Nature, we see that the annual energy input for a hectare of apple trees is 500,000 MJ, or 56,230 kWh at 3.6 MJ per kWh and 2.47 acres per hectare. According to this article, 800 bushels of apples per acre appears normal, which is 33600 lb of apples at 42 lb of apples per bushel. This equals 1.67 kWh per pound of apples. Here are the estimates for eggs, taken from Without The Hot Air page 77. Using a standard of eight eggs to a pound, convert from metric to English measures and arrive at the 4kWh estimate. Chicken is examined in detail on Without The Hot Air page 79, and I use that estimate, converted to kWh per pound. For Pork, I use McKay’s estimates from page 77, and convert them for each animal. McKay estimates that a 65kg human burns 3kWh per day, or 0.0462 kWh / kg / day = 0.021 kWh / pound / day. McKay uses a pig lifespan of 400 days, and thus notes that if you want to eat a pound of pork every day, 400 lb of pig must be alive at any given time (one pound for each day, so that the rate of pig production matches the rate of consumption). McKay further estimates that only two-thirds of an animal can be used for meat, so we actually need 600 lb of pig to generate one pound of meat per day. 600lb * 1 day * 0.021 kWh / pound /day = 12.6 kWh for a pound of pork. Beef is calculated exactly as for Pork above, except that a cow lives for 1000 days instead of 400 days. 1000 lb / 0.66 (wastage factor) * 1 day * 0.021 kWh / pound / day = 31.5 kWh for a pound of beef. Calorie data was taken from caloriecount.about.com, and kcal (food calories) were converted to kWh for energy efficiency calcs. We simply convert the calories in one pound of each food into kWh, and then divide that number by the energy required for production of one pound of that food. How can corn have an energy efficiency higher than 100%? This means that the energy that human beings put into the process of growing, distributing, and eating corn is less than theenergy provided to the human body by the corn. The hidden factor here is sunlight – corn plants are drawing energy from the sun for free, and storing that energy, which humans later consume. The US economy is only about 33% energy efficient today, with two-thirds of primary energy production lost before it’s put to use. Energy efficiency improvements will be a huge part of sustaining economic growth moving forward. 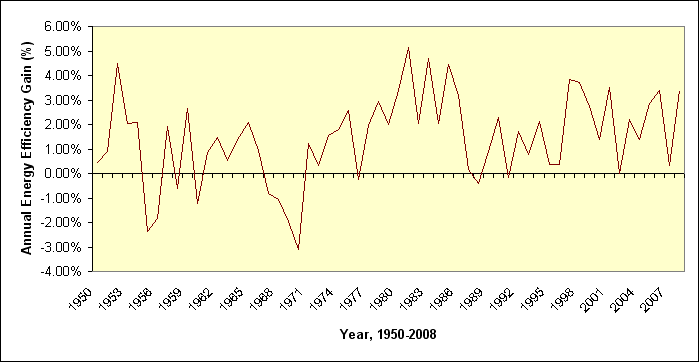 What is the total energy efficiency of the US economy? More precisely, what percentage of primary energy input, whether from fossil fuels or renewables, is actually used for our benefit? The Lawrence Livermore National Laboratory (LLNL) studies energy flows within the US economy, and produces the diagram above annually. For 2008, LLNL calculates that the nation’s energy efficiency is roughly 42%, with the remaining 58% of energy lost primarily as wasted combustion heat . By itself, having a 42% efficient economy indicates that significant improvements in our energy security are possible through efficiency improvements alone. But there is ample evidence that the US is significantly less efficient than the diagram indicates. One key assumption in particular biases the calculation: LLNL assumes that residential, commercial, and industrial users of energy are 80% efficient in their end use of energy. The primary uses of energy in American homes are heating, cooling, and water heating, and these activities are closer to 50% efficient than 80% efficient in the average American home . Even the most efficient lighting is only about 20% efficient, and huge number of computers and gadgets using and powering the internet can be incredibly inefficient . While industrial users of energy have an economic incentive to prevent waste, they can’t avoid the inefficiencies inherent in lighting and mechanical engines. Finally, transportation in the US is probably closer to 20% efficient, rather than 25% as used in the LLNL study . In place of the 80% efficiency used by LLNL, we can substitute a 50% efficiency estimate for residential and commercial users, a 75% estimate for industry, and a 20% estimate for transportation. Using these estimates of end-use efficiency, total energy efficiency in the US economy is around 33%. The US has huge room for improvement, which should provide hope for our energy future. If the US were able to improve its energy efficiency from 33% to 50%, primary energy usage could be cut by a third. The US could supply today’s annual energy needs with 67 quads (quadrillion BTU) instead of 102 quads. That’s $650 Billion worth of energy at today’s prices ! 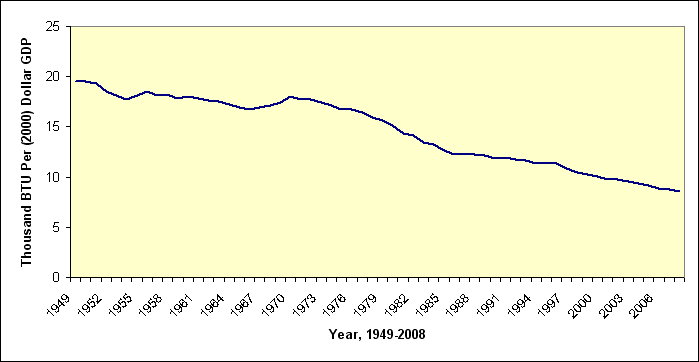 During the energy shock of the late 70’s and early 80’s, the US decreased the energy intensity of its economy by as much 5% per year. Given the dual constraints of rising world energy demand and Peak Oil, a similar effort may be required soon. It’s good to know that the US has plenty of room to improve, and to know that improvements in efficiency can generate huge savings. Neither the economy nor even a single power plant can ever by 100% energy efficient. The heat engines (internal combustion engines, fossil-fuel power plants, etc) used to run most of modern society cannot exceed certain theoretical limits governed by the laws of thermodynamics, so that even the most efficient combined-cycle power plants today are only about 60% efficient. American residential energy use is dominated by hvac usage and water heating, as the EIA shows in table 14 of its energy usage survey. Household furnaces range from 65% to 90% in efficiency, but the typical house loses 25% of its heat through its windows alone, so that heating a house is perhaps 50% efficient overall. Gas water heaters are 50-70% efficient. None of these numbers take into account time when a home is unoccupied, when energy efficiency is effectively 0% if systems are not turned off. Incandescent light bulbs aren’t even 5% efficient, while fluorescent bulbs reach around 15% efficiency. During the summer and in warmer parts of the country, the majority of the energy used in lighting (lost as heat) must be counteracted with air conditioning! Computers and data centers are also incredibly inefficient, particularly when measured from a standpoint of average cpu utilization. Servers in data centers are typically configured with enough cpu power to sustain peak activities like handling the Christmas rush at an ecommerce website. As a result, they spend most of their time at very low average utilization, and probably run at less than 10% energy efficiency. Internal combustion engines are only about 20% efficient in real-world driving conditions, and this may not take into account extraordinary efficiency losses caused by traffic jams, which themselves result in billions of dollars worth of economic losses annually. The EIA Kids’ page provides convenient numbers on the BTU content of different fuels (if only adults knew this much!). We can calculate the rough average price of a BTU by averaging the cost per BTU of oil and the cost per BTU of coal. According to the EIA, a ton of coal costs roughly $50, and contains 19.98 million BTU, for a cost of $2.50 per million BTU. A barrel of oil costs roughly $80 and contains 5.8 million BTU, for a cost of $13.80 per million BTU. A simple average gives us a price of roughly $8 per million BTU. Saving 35 quadrillion BTU of energy with changes at power plants thus equates to a savings of $280 Billion per year. If the energy efficiency changes occur at the point of end use, however, the savings could be much greater, since higher value forms of energy like electricity are much more expensive. One kilowatt-hour of electricity equates to 3412 BTU, and costs roughly 10 cents, which equals $29.30 per million BTU. If the 35 quadrillion BTU of energy efficiency savings all occur at point of end use, approximately $1 trillion in annual savings are possible! In reality, efficiency gains will occur across the system, so an average of the two estimates yields a savings estimate of $650 Billion per year.